We've noticed your review of SliceTruck and felt your review deserved to be reviewed. -Great way to start a paragraph, I applaud you. "Hands Down the best pizza"
-"Hands Down" is our favorite superlative. -Important to note. I've got my spine, I've got my Orange Crush. "none of that Pizza Hut crap"
-Wait one second here. You do know you can get any size pizza with any topping at Pizza Hut for only $10. "The sauce is pleasantly rich and a bit tangy"
-All sarcasm aside, this is exactly what we were going for and I'm thrilled you actually get it. 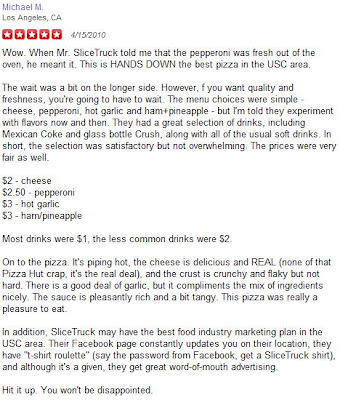 SliceTruck's review of your review. Initially I thought, "a review on the interenet"? Meh. How could this possibly be good? But then I read it and I was like nom nom. If you're used to reviews off a newspaper you may not be ready for this but I'd say it was damn good and I plan to try other reviews off the internet.